First, I want to thank my 16-year-old daughter, Kendall, without whose permission I would not be allowed to share this story. See this impressive statue? 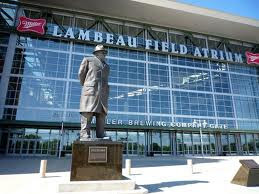 It's the great Vince Lombardi, posthumously lording over Lambeau Field on a gorgeous, sunny day. Over to Vince's left is another statue, of Curly Lambeau. On Saturday, I was at the mall when I got a frantic call from Kendall, who was at Lambeau Field for a choir event. She was still in the parking lot, though, in a terrible fix. At first, because she was so panicked (and crying), I thought that she had been in an accident. "Mom, no; I didn't get in an accident, but you have no idea." [sob] It's really bad. Everyone's staring at me and pointing. [sob] Mom, I don't know what to do! Can you come down here?" Of course, I assured her that I'd be there asap. I arrived about 10 minutes later. To give you some background...the stadium parking lot was packed; the organization had invited the community to come for a free holiday kick-off (inside the atrium). There was all kinds of activity there for that. Plus, there was a home-game Sunday and thousands of people in town for that, many who had come to the stadium to visit the Packers Pro Shop. (And remember; it was dark and raining.) Take all of that and add the stupidity of the parking logistics--some genius had closed two rows of parking with a gate at the end, resulting in a one-way entry to those rows and no way out! Kendall (like many, many other drivers behind her) had driven down there, only to find there were no spots and no outlet. She had no choice but to either do a y-turn in a tiny space (with a line of cars behind her, the drivers of which having no way of knowing what she was doing or why) or pull into a handicap space and back out again. She chose the latter. However, she was nervous and driving a Suburban (when she's used to a small car); two minutes later, she was in one of the tightest spots of her life. These are actual photos of the predicament Kendall had gotten herself into; they are not doctored photos. I know, right? Could you even do that if you tried?! She was afraid that there was no way to get the truck out of situation without hitting the car next to her. People were stopping, staring....pointing...commenting...all not realizing that Kendall was still in the truck, paralyzed, with no idea how to get out of her predicament. Don't worry-- the choir performance went off without a hitch; Kendall and her fellow songbirds sang like larks, and the acoustics inside the atrium were fantastic. I'm pretty sure that Kendall will never forget the night that she found herself too close for comfort, right beneath the shadow of Vince Lombardi and Curly Lambeau. No harm done. No foul. [She had not touched the other vehicle, believe it or not.] We all have memories of tough spots we've found ourselves in with cars as newer drivers. Help Kendall feel better; if you haven't blocked yours out, please share your embarrassing moment as a new driver. A situation like that wold bring me to tears too...and I have been driving for forty years! 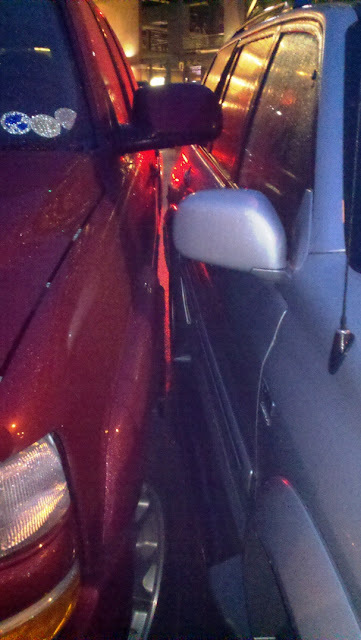 I am amazed that you could back out with no outside direction and not touch the other car. I am also sure Kendall knows how fortunate she is to have you for a mom.